This weekend the Wineries of Niagara-on-the-Lake are hosting a new event called Dig our Roots. 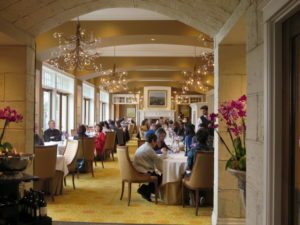 Unlike the popular passport programs, the idea behind this event is to learn more about the unique properties of the appellation from the roots up. 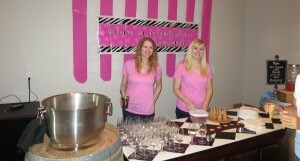 For the event, each winery designed its own unique “experience” around the general theme. 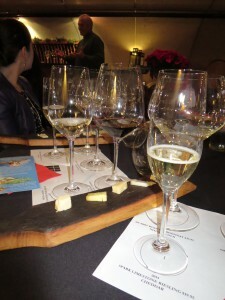 Stratus Vineyards put together a tutored tasting with the intriguing title: Tried and True, Quirky and New. Stratus, which opened in 2005, is best known for its luscious blends – the signature Stratus Red and Stratus White, as well as its more moderately priced Wildass Red and Wildass White. To create the blends, winemaker J-L Groux started playing around with growing some grapes you don’t find too often in the region (for example, Tempranillo and Tannat). These experiments proved rewarding in many ways. Besides providing varieties that add colour and depth to their magnificent assemblages, Stratus has also released some as single variety wines. The tasting was designed to showcase some of these varieties. Ben Nicks, senior wine consultant, led the fascinating seminar. From the comfort of the large private tasting room that overlooks the vineyard, Nicks explained the unique geography of the 55-acres. 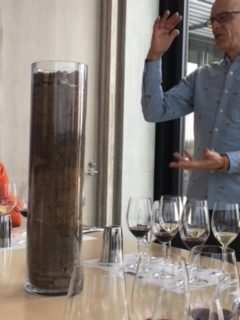 The show-and-tell wasn’t limited to the wines – to show the different strata that lies below the surface, he showed us an oversize glass vase containing a cut-away sample of the vineyard’s soil. He also described some unusual aspects of the winemaking processing. For example, he explained the difference between domestic yeast, wild yeast, and the process they often use (for example, with their Chardonnay), which is to simply rely on the yeast that naturally adheres to the grapes. It was also fascinating to learn about why and how they aerate wines during the fermentation process. I had heard Nicks describe micro-oxygenation before and how they use a hydrosieve and I was interested in hearing more about it. After the seminar he was kind enough to take my friend and me into the production area for a look at the sieve. He even let me shoot a short video of him describing how it works. You can find the video here. 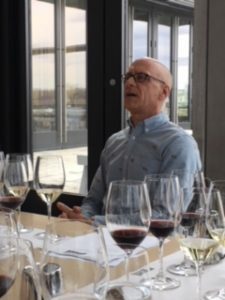 And of course, during the seminar we tasted some wine – six different varieties: Sauvignon Blanc, Sémillon, Chardonnay, Cab Franc (Stratus’ most widely planted variety), Tempranillo, and Tannat. And, to reinforce the fact that winemaking is an interesting combination of art and science, they provided facts and figures about each wine, including the year the vines were planted, the number of blocks planted of each type, the specific harvest dates for each, and the exact number of days each spent in oak. 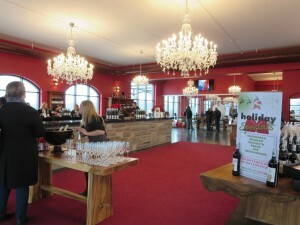 Hats off to Stratus Vineyards and to the Wineries of Niagara-on-the-Lake for the innovative Dig our Roots event. It’s clear that the experiences created under this aptly-named title are meant to provide wine enthusiasts with a unique way of learning about the appellation – from roots to bottle. For a taste of the seminar, click here for a short video of Nicks introducing the event and Stratus Vineyards. 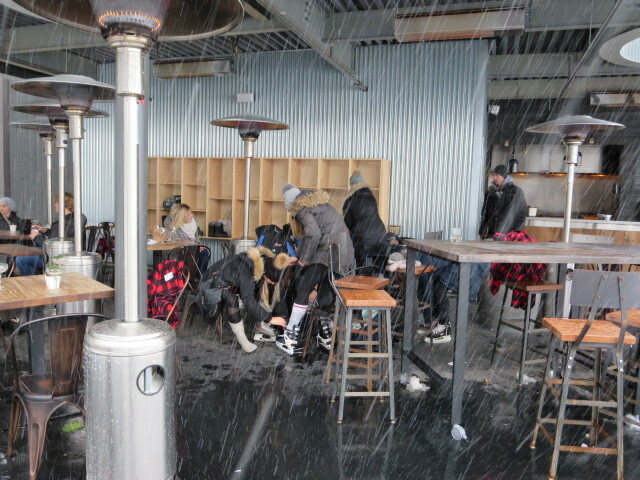 To some, February is the last hospitable month in Ontario. (I say “to some” because, well, it’s actually one of my favourite months!) But, the Wineries of Niagara-on-the-Lake have the perfect antidote to those who think the only good thing about February is that it’s only 28 days long – The Days of Wine & Chocolate. The Passport program runs every weekend (Friday-Sunday) in February. As the name implies, the 20 participating wineries have paired one of their wines with something that has chocolate as an ingredient. 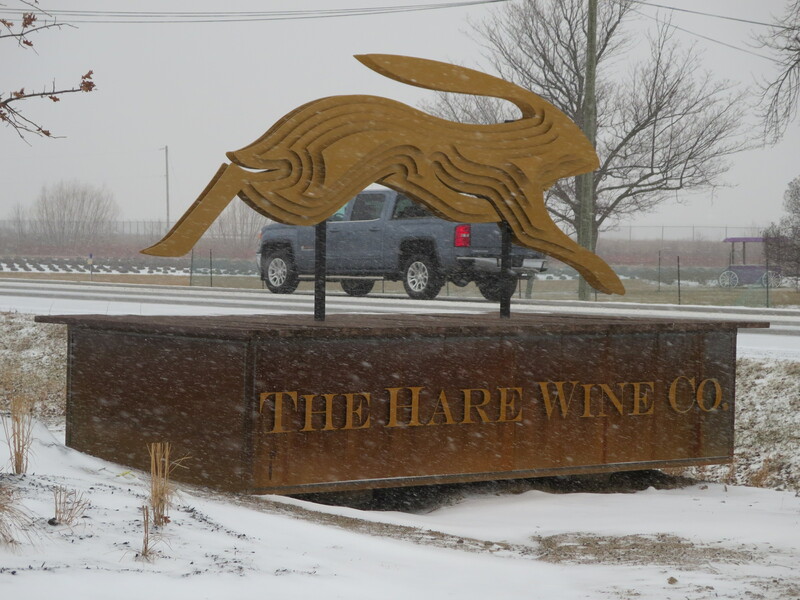 The Wineries of Niagara-on-the-Lake invited me to attend and so a girlfriend and I hit the road yesterday, despite the snowy forecast. It so happened that I took this friend last year, so I tried to find some places she had not been to. On our drive down, I mentioned that I had been thinking about the route we might take to make it a bit different from last year. She didn’t seem to care – she was just excited to be spending a day in wine country. That’s the right attitude for sure! The day ended up being so fun and relaxing. 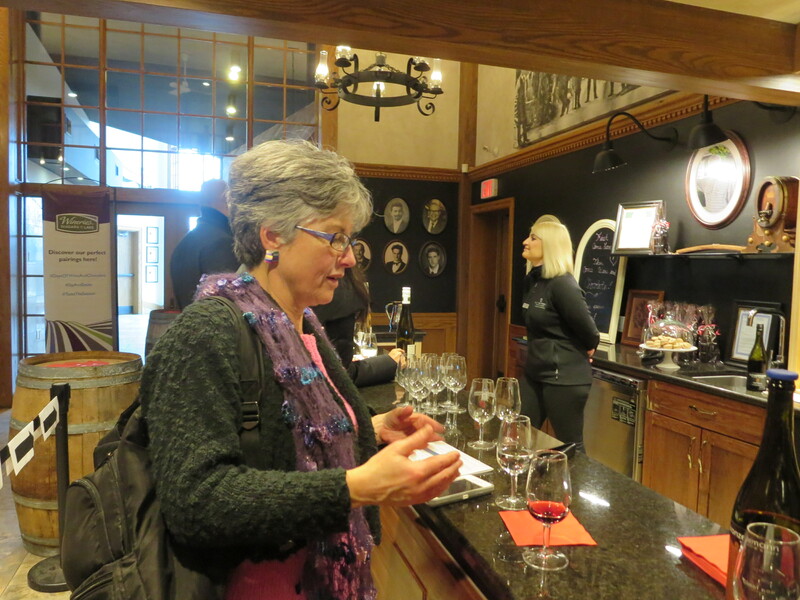 The wineries were quieter than they might otherwise be for such an event – but that meant that we had more opportunities to chat with winery folks, which is one of best things about visiting Ontario wineries. You can learn so much and most folks you come across are only too happy to chat. We both really enjoyed the pairing – and the white chocolate in the sour cream was absolutely delicious. My friend had never been to Ravine Vineyard Estate Winery, so that was on my list of places to stop. It’s a lovely spot. Though it’s quite large, it feels secluded and cozy. Though I’ve been there many times, it seems every time I go there, there’s something unexpected. (Last time it was the beautiful free-range hens and rooster roaming through the fines.) This time it was an ice skating rink nestled in a spot between the restaurant and the vineyard. A staff member was out on the ice with a snow blower, with a family waiting to hit the ice. It turns out the rink is open to the public – free of charge – and the gang that was there were locals who have been there before. 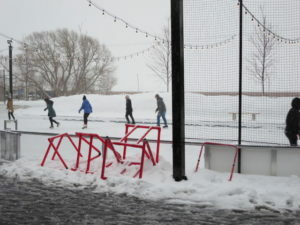 (One of moms there explained that one of the kids on the ice had learned to skate there.) 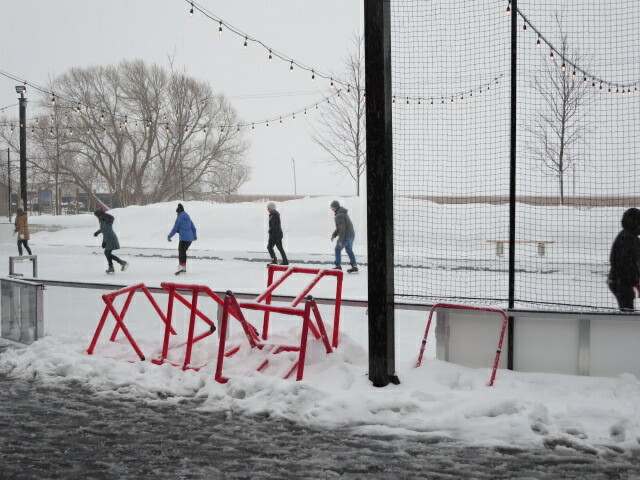 It’s a home-made rink – so if it’s cold enough for ice, it’s open. What fun! 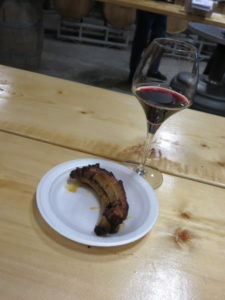 When we looked at the list of pairings, I mentioned to my friend that I was surprised to see that PondView Estate Winery was serving pork back ribs, as they served that last year, though this year they are serving it with one of my favourite Pondview wines: their Bella Terra Reserve Cab Sauv. My girlfriend had the right outlook – she said, “Well, if there’s something you’re good at – and the ribs are awesome – why not stick to it!” How right she is – so off we went. At Reif Estate Winery we got into another back room that I’d never been in before. A big, but cozy space, thanks to the barrel-lined black walls. 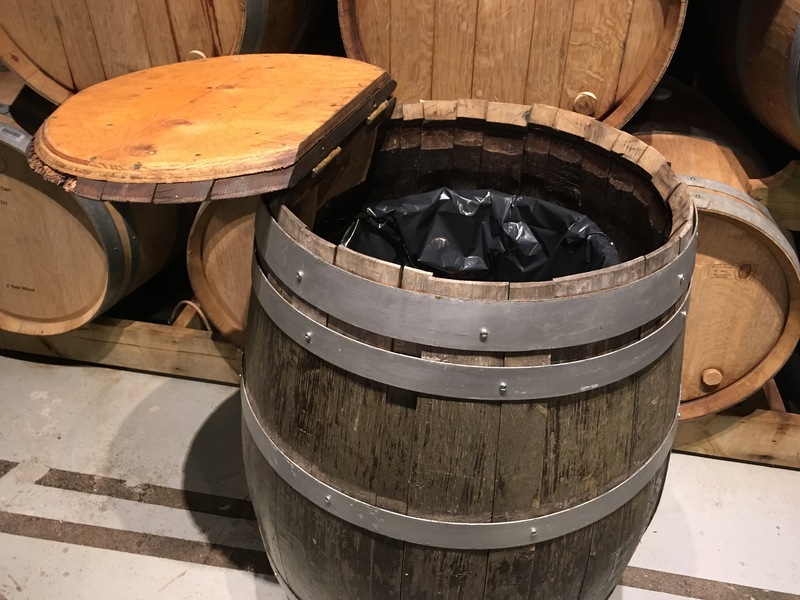 Very different… (and check out the clever re-purposed barrel). 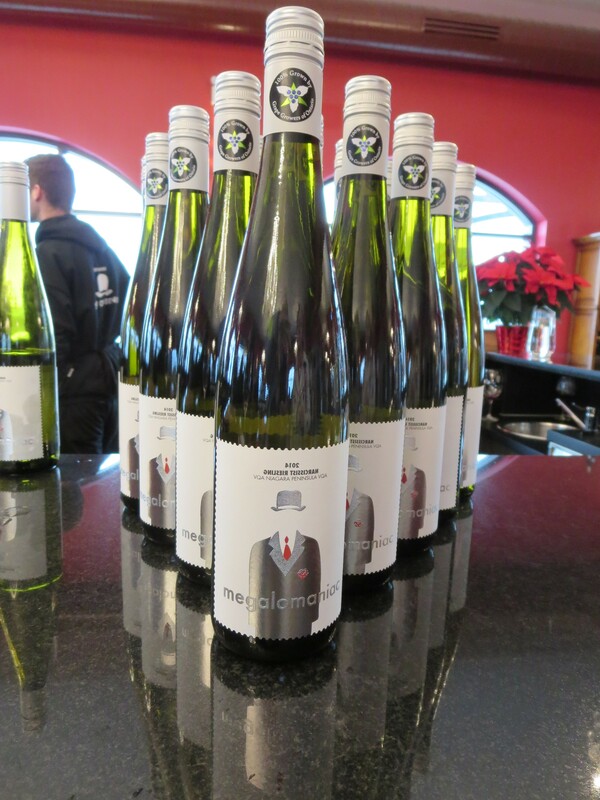 Another place we made a point of stopping at was Wayne Gretzky Estates Winery & Distillery. 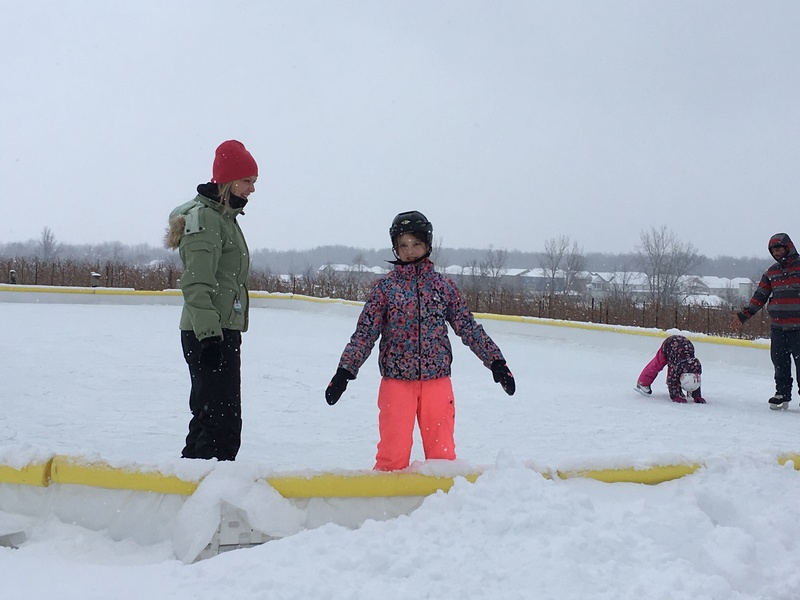 We wanted to check out Wayne’s ice rink – I mean, really… It was a popular spot, as you’d expect. The crowd was definitely more millennial than boomer (my demographic) – so it has a different vibe – very fun and VERY popular. The winery has a separate building where the spirits are. Neither of us are into whisky, but cream whisky is… well, dessert, which we are into. We had to try it. It is quite nice – think Bailey’s Irish Cream, with (to me) a hint of cocoa. Another surprise was that there were a few families with kids. 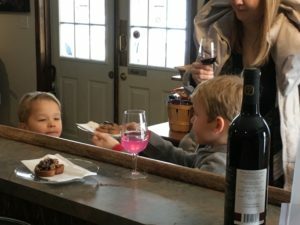 I thought that was unusual, but the little ones were happy – and the wineries all serve non-alcoholic drinks for those with a designated driver passport. In watching the children, it’s clear that they enjoyed trying different things as much as their parents did. We ended our day back at the restaurant at Ravine. We didn’t have a reservation, but they had room for us and, to our delightful surprise, the were running a prix fixe special that was unbelievable: any appetizer, main and dessert from the regular menu for $35. What a treat! I had smoked arctic char, braised short rib of beef (normally $36 alone), and sticky toffee pudding. My friend had the mushrooms on toast, pork loin, and a chocolate tart. The food was spectacular and the service was exceptional. If you’ve not been to the restaurant at Ravine, I can’t recommend it enough. On the way home we were talking about the day. In terms of favourites, we especially enjoyed the savory food (Inniskillin, Pondview, and Jackson-Triggs). 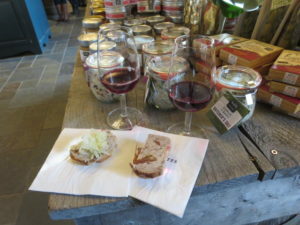 My favourite pairing was Jackson-Triggs’ 2016 Grand Reserve Pinot Noir and the smoked chicken and chocolate cheddar panini with mushrooms and preserved cherries. My favourite wine was the 2013 Stratus ‘Weather Report’ Red. 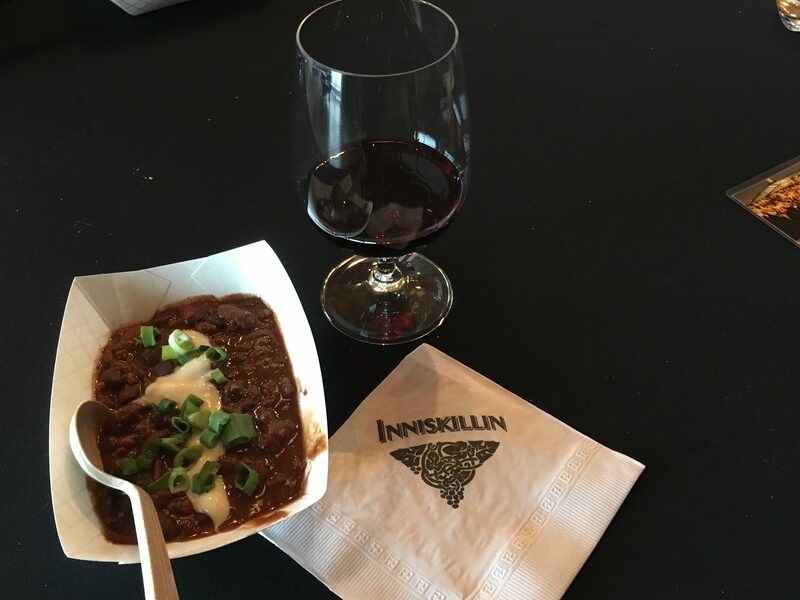 There are still two more weekends to enjoy the Days of Wine & Chocolate and you can order your Passports ($45+ tax or $25 for designated drivers) online. I hope you have the opportunity to check it out. It’s Family Day weekend here in Ontario – a long weekend designed to give folks a mid-winter break. Most years, that means a weekend of snow-filled activities. With an unusual early spring thaw (temperatures topping 10°C – over 50°F), I’m sure lots of folks had to change their plans. Fortunately, for me and my friend Cory, the weather was perfect for a day of winery visiting in Niagara-on-the-Lake (NOL). 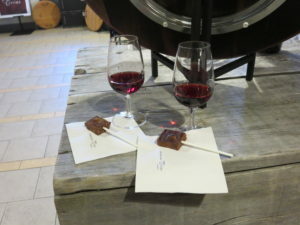 As I mentioned in my last blog, the Wineries of NOL provided me with a couple of passes to the Days of Wine and Chocolate event that’is going on all month. Here are a few of the highlights of the day. Our first stop of the day was Pondview Estate Winery. 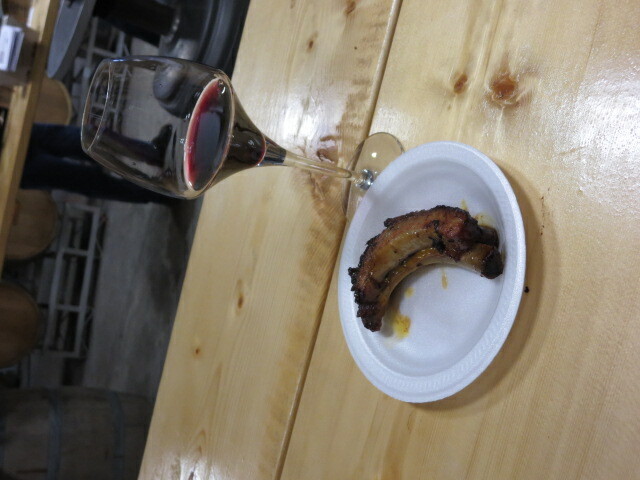 They were serving their 2013 Bella Terra Cab Sauv with ribs in a chocolate infused sauce. I have to say – Pondview never disappoints for these events. They always showcase one of their nicer wines and they always serve something tasty. This year was no exception. The ribs were outstanding. The Bella Terra is a lovely wine, but because they were serving in their barrel room, the glasses and the wine were very cold, which was a shame. Regardless, it was a great pairing and both of us agreed that it would be hard to beat. 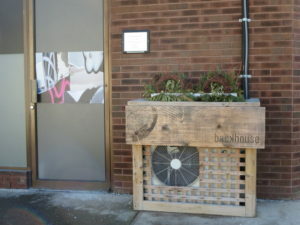 The only pre-planned part of the day was lunch at Backhouse restaurant. 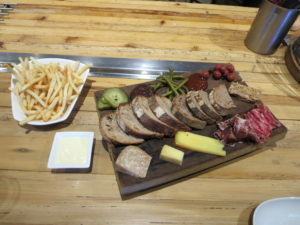 I was keen to try the restaurant because I’ve sampled Chef Ryan Crawford’s charcuterie at different events. Crawford and his partner Beverley Hotchkiss opened the restaurant about 18 months ago and it has been very well received, so I made sure to make a reservation. I knew exactly where it was (242 Mary Street in a small plaza where Mary Street intersects Niagara Stone Road), but from the outside, the restaurant is easy to miss. And, because the windows are all covered over, it almost looks like they’ve gone out of business. Indeed, we followed a couple in and we overheard one of them saying to the hostess that he thought maybe it was closed. But, it’s so attractive and welcoming inside, you quickly forget about what the outside looks like! 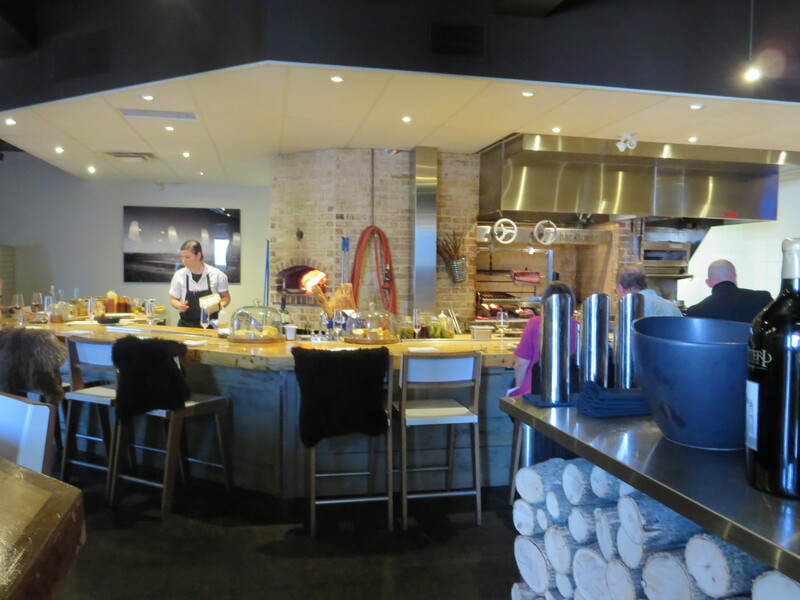 The host asked us if we wanted a seat at the Chef’s bar or at a table. Normally I don’t like sitting at the bar – but it was clear that that was where the action was, and the seats were very comfortable looking. When I asked what she’d recommend, the hostess said, “Definitely the bar – that’s considered our premium seating”. So we took her suggestion – and boy were we glad we did. Sitting there gave us a chance to talk to the staff and watch as they lovingly plated different things. 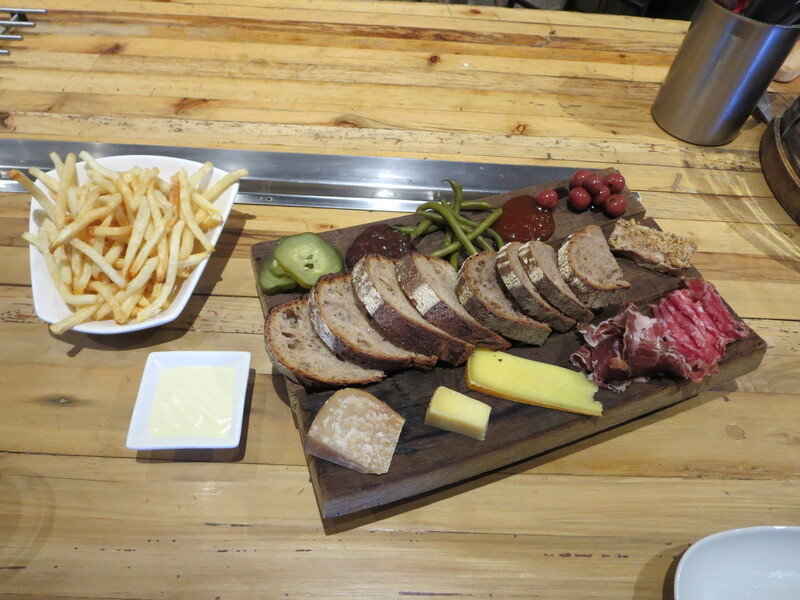 We didn’t want anything too heavy and since I knew that Chef Crawford is known for his charcuterie, we settled on the Backhouse Plate for 2 and a side order of frites. The Backhouse Plate features a selection of charcuterie, bread, cheeses, preserves, and pickled green beans and pickled sour cherries. It was delicious. We had a peak at the dinner menu. They have some items a la cart, and a selection of tasting menus that sounded amazing. 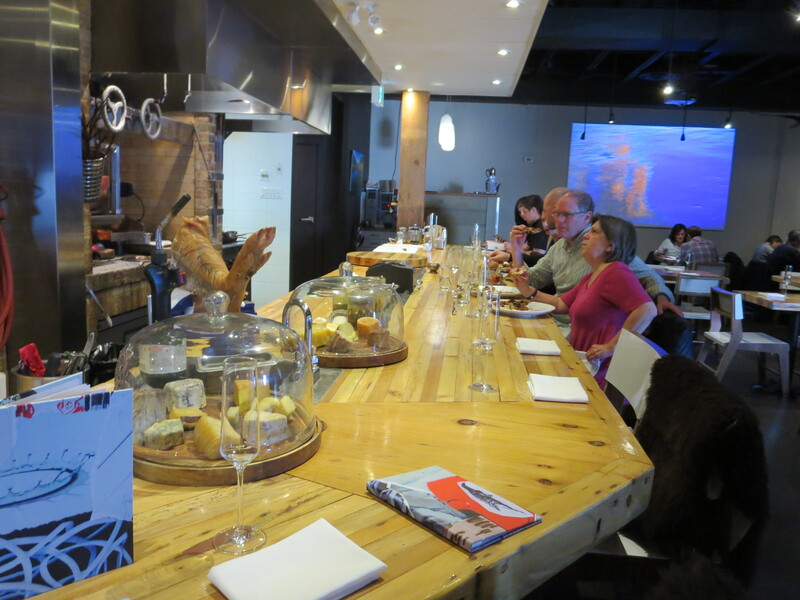 I’ll definitely be back to try a tasting menu – and I’ll definitely book the seats at the Chef’s bar. We purposely didn’t have dessert at the restaurant because we wanted to try some of the Days of Wine and Chocolate dessert pairings. We had noticed that Trius Winery was serving S’mores, and that sound fun. Turns out we didn’t read the description that carefully, so we were surprised when it wasn’t a traditional S’more – it was S’more fudge. They paired it with their 2015 Gamay Noir. 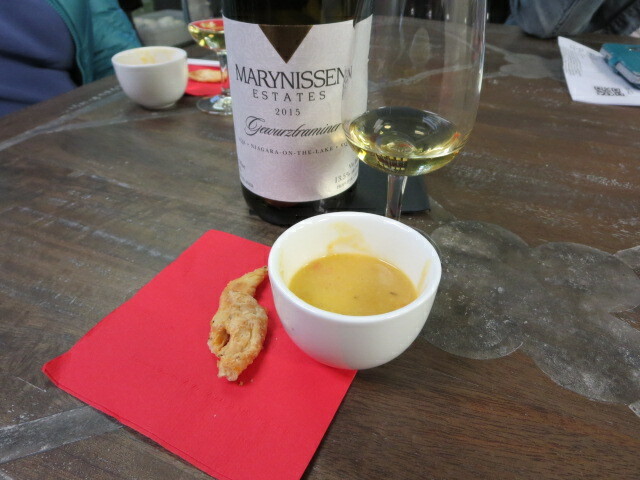 That turned out to be one of Cory’s favourite wines of the day – and the pairing made both somehow richer. 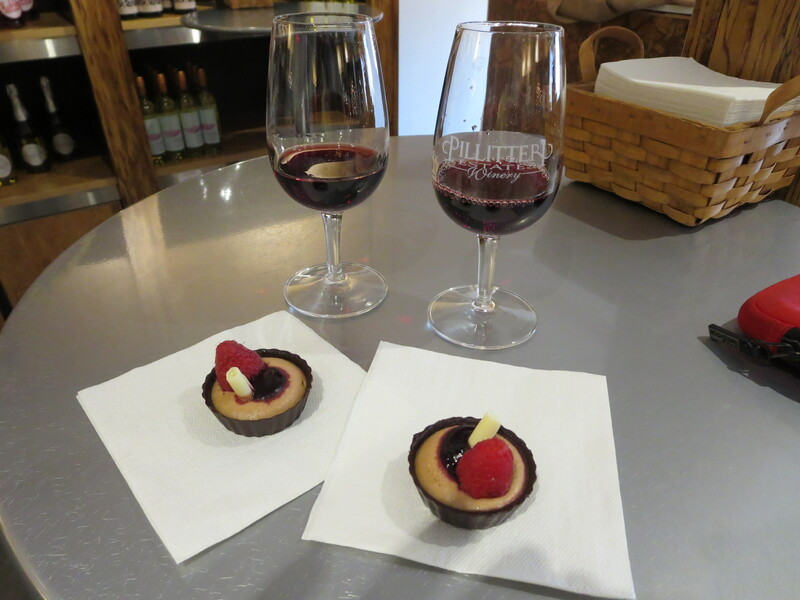 Another standout in terms of a wine/dessert pairing was at Pillitteri Estates. 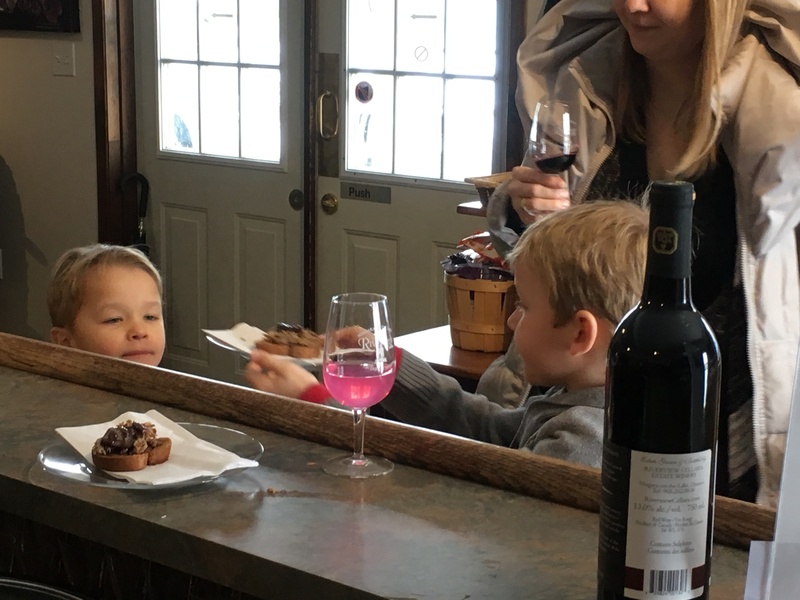 They were serving their 2013 Cab Merlot with a dark chocolate cup with milk chocolate mousse with a drizzle of Cab Merlot raspberry compote. The lightness of the milk chocolate mousse and the tartness of the compote paired very well with the wine. 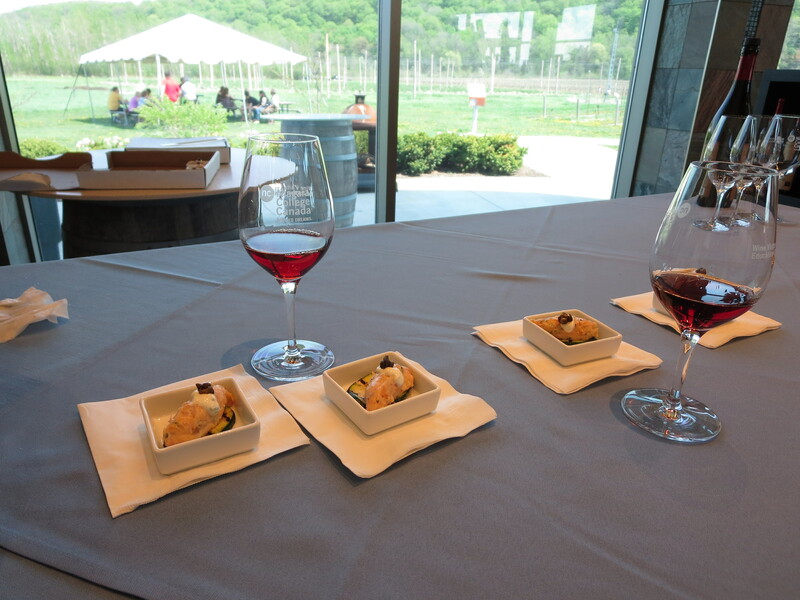 Have you ever participated in one of the coordinated passport events wineries run in a particular region? If you haven’t, you should… And if you have – let’s compare notes about it. 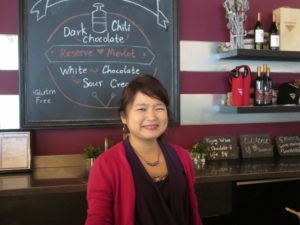 The Days of Wine and Chocolate event is currently going on all this month. 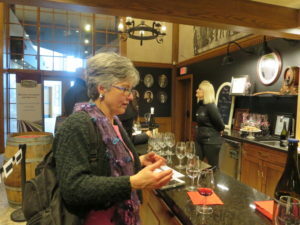 The marketing folks at the Wineries of Niagara-on-the-Lake gave me a pair of passports, and a friend and I checked it out on Friday. Passport programs are brilliantly straightforward. You buy the passport (the pass) and then head to your favourite participating winery – or better yet, one you’ve never tried! 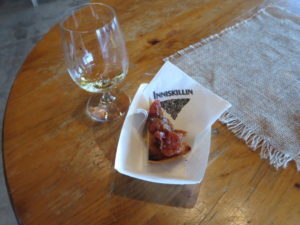 At each winery, you get a sample of some nibble and a wine they’ve paired with that delectable bite. The pairings are based on the theme – in the case of the Days of Wine and Chocolate you can guess what the theme is…. Because I invited my friend, I felt responsible for planning our day a bit. I know my friend didn’t care – she looked at it as just a great way to spend some time together, which is another great excuse to order up a couple passports! 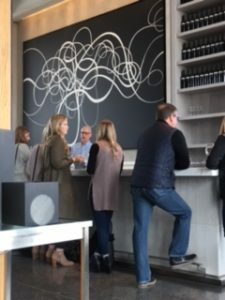 So, I decided to frame our day around a few specifics – a few specific pairings that intrigued me and a few wineries that I was especially interested in visiting. First, I wanted to stop in at The Hare Wine Company – it’s a brand new winery on Old Stone Road. 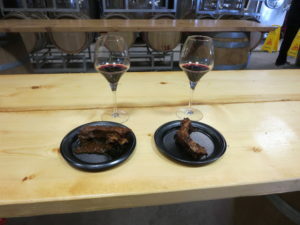 I also planned on stopping in at Konzelmann Estate Winery – I thought it would be interesting to compare a brand new winery (Hare) with one of the original wineries of the area (Konzelmann). I also wanted to stop in at Lailey – it changed hands last year and I wanted to learn a bit more about their plans going forward. I also had the list of what each winery was serving and I had marked some that I thought might be especially interesting. 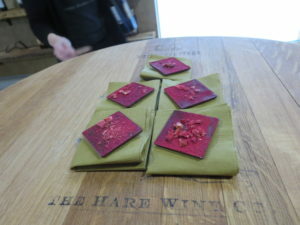 One of the impressive things about the Days of Wine and Chocolate theme is how creative the wineries are with incorporating chocolate into different food. For example, cocoa aioli on a smoked meat sandwich, chocolate drizzled popcorn, a dark chocolate and bacon brownie, dark chocolate mole sauce. 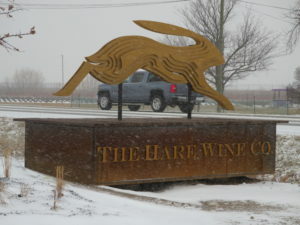 The Hare Wine Company has only been open about three months. I had perused their website before we left and it had a lot of interesting information about the loyalist history. 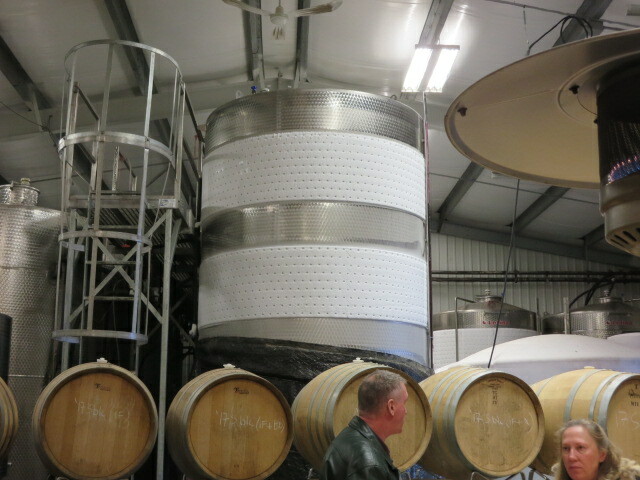 But, you never get a sense of what the winery is aiming to be from a website – you need to see it in person to get that. Sommelier and assistant cellar master Alina Trefry was excited to tell us about the winery and their plans. I had passed it before and was amazed at its size – not exactly a roadside stand. Alina explained the architecture and how well planned it is – everything from space to let food trucks into the courtyard, to the fact that the displays are all on wheels so they can move them around for different events and weddings and such. Here’s a short video of Alina talking a bit about the winery. I had read that the building is crafted from re-claimed building materials and Alina confirmed that. As well, someone had given me a heads-up about one of the unique side rooms, so I asked about it. 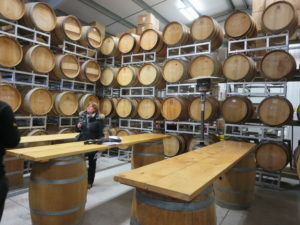 Indeed, they have a private tasting room off the main hall whose walls are made of old barrels. If you visit the winery and they aren’t too busy, ask if you can see it – the three dimensional effect is very neat! They have 12 acres under vine: half are planted with Riesling and half with Vidal. They also locally source other grapes. They have four different series of wines in different price ranges – from their Jack Rabbit series ($14-$16 range) to their Noble series, which currently features a $120 Cab Franc appassimento blend. Here’s a short video of Alina describing the Noble series. For Days of Wine and Chocolate they were serving the 2013 Crown Land Red with Ecuadorian bitter dark chocolate with freeze-dried strawberries. To be honest – when we read the description, it didn’t appeal to me OR my friend. But, we were there and it would have been rude to turn it down. Well, what a delicious surprise. 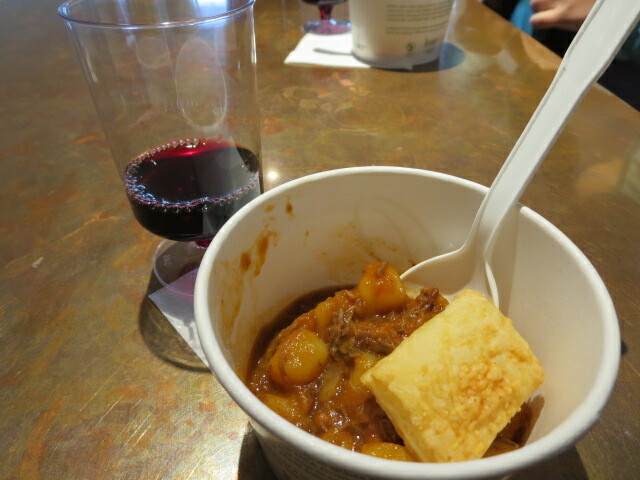 The chocolate and the Cab Franc were Delicious. Alina said the chocolate was made for them by a local chocolatier and, it featured a dusting of raspberry powder n addition to the freeze-dried strawberries. The whole thing – the chocolate and wine – creates an explosion of sweet and tart. I was hoping the chocolate was available for purchase at the winery, but it wasn’t. But, Alina was happy to share that it came from Willow Cakes and Pastries (Mary and Mississauga Streets in Niagara-on-the-Lake). Our last stop of the day was Lailey Winery. As I mentioned, I knew that the winery, which used to be called Lailey Vineyard, has changed hands. The new owners are John Chang and Allison Lu. Besides the subtle name change, the first thing you notice that’s different is the totems – there’s one outside and one inside. 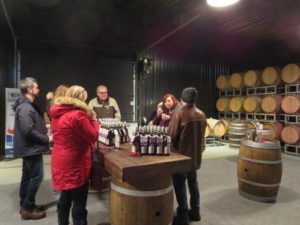 The new owners also own wineries in BC and, as the woman who served us explained, the totems are meant to greet visitors and as a connection to the new owners’ ties to BC. The other immediately noticeable difference is that the tasting room has tripled in size. When I mentioned that, our server explained it’s because they now get a lot of buses and it’s easier to accommodate groups. 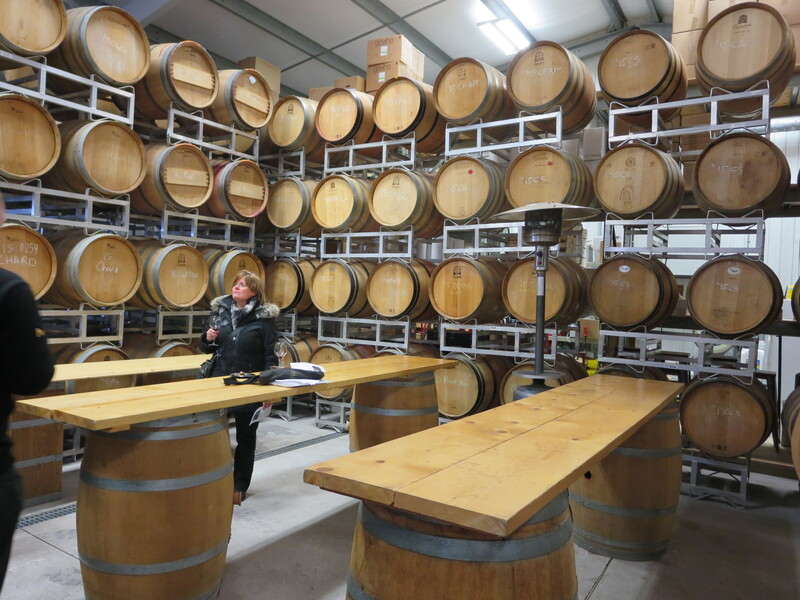 Owner Allison has taken over the winemaking. (Derek Barnett is now working out of Karlo Estates in Prince Edward County.) Many of the wines on the shelves – including the 2013 Sauvignon Blanc Fume that was featured in the Days of Wine and Chocolate pairing – are vintages that were crafted by Barnett. Despite the reference to fume in the name, I didn’t pick up much smokiness in the Sauvignon Blanc. They paired it with a petite lemon tart that was to die for! Again, I asked who made the tarts and I was told they sourced it from the Watering Can in Vineland (3711 King Street) – definitely a café that would be worth checking out. It will be interesting to watch how Lailey Winery will change. Rumour has it that they’ll focus primarily on icewine and that much of their production will be for export. We’ll see… Meanwhile, for the many folks who loved what Derek produced, stop in to stock up before it’s all gone. The only other pre-planning I had done was finding a place for lunch. I had a short list of places I had wanted to try. One of them was The Old Winery Restaurant on Niagara Stone Road. When I happened to ask someone at Konzelmann for lunch suggestions, he mentioned that one. So, that’s where we went. 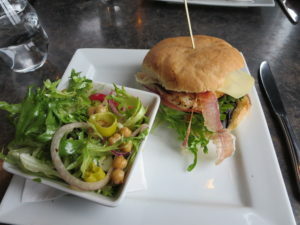 The menu’s diverse, the prices reasonable and the food and service were good. In short – it’s a place I feel confident recommending. I’ll be heading down to NOL again for Days of Wine and Chocolate, and so stay tuned. 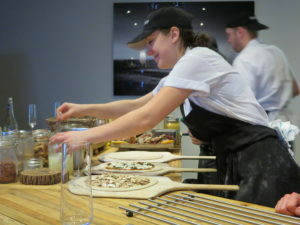 Oh – and watch for a separate post about Konzelmann – we did their Junk Food Pairing tasting, which was great! 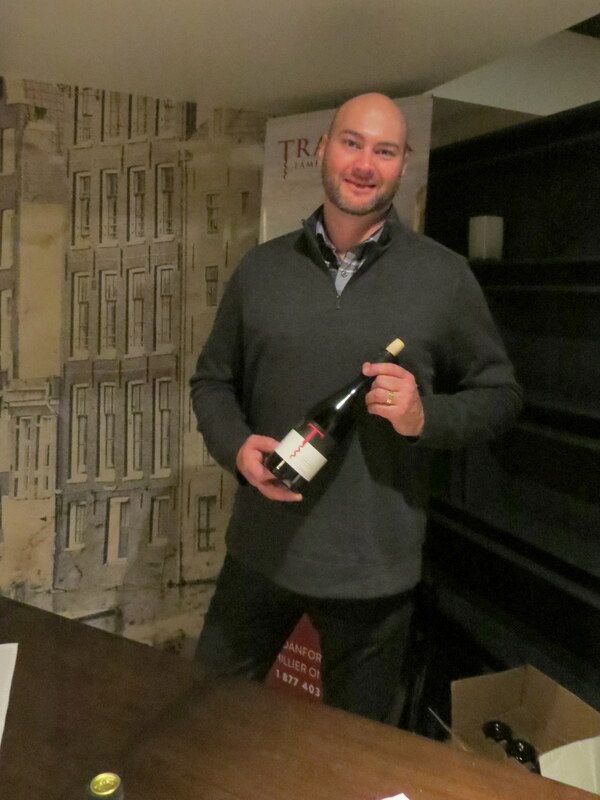 Traynor Family Vineyard – with Mike Traynor, winemaker/owner was there to tell us about what he was pouring and how things are going at the very new winery. All the wines were very good representations of Ontario wines. It was interesting to hear how the past few harsh winters and springtime freezes have impacted the PEC wineries. As a result, many are ending up sourcing at least some of their grapes from other growers — typically in the Niagara region. If I had to pick a favourite from each winery, I’d choose: The Grange’s 2010 Pinot Noir Reserve, Mike Traynor’s 2014 Sauvignon Blanc, and Trail Estate’s 2013 Cab Franc-Cab Sauv blend. If you can’t make it to any of the weekend-long events, the organizers have you covered with the Summer of Chardonnay Passport ($25). 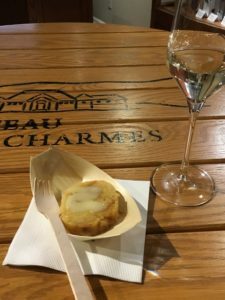 The passport lets you enjoy special Chardonnay tastings through Labour Day at 23 of the Ontario wineries that will be at i4C. 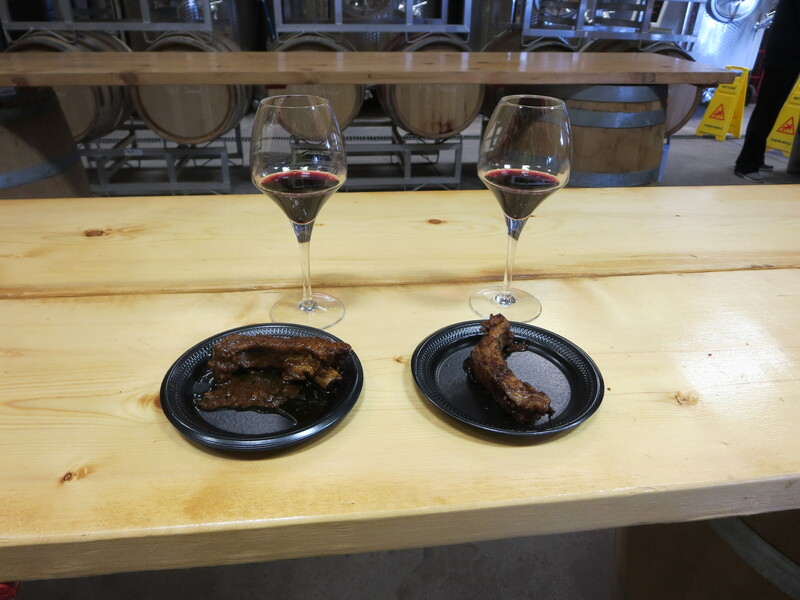 Sip and Sizzle is an annual passport event that over two dozen wineries in the Niagara-on-the-Lake hold in May. 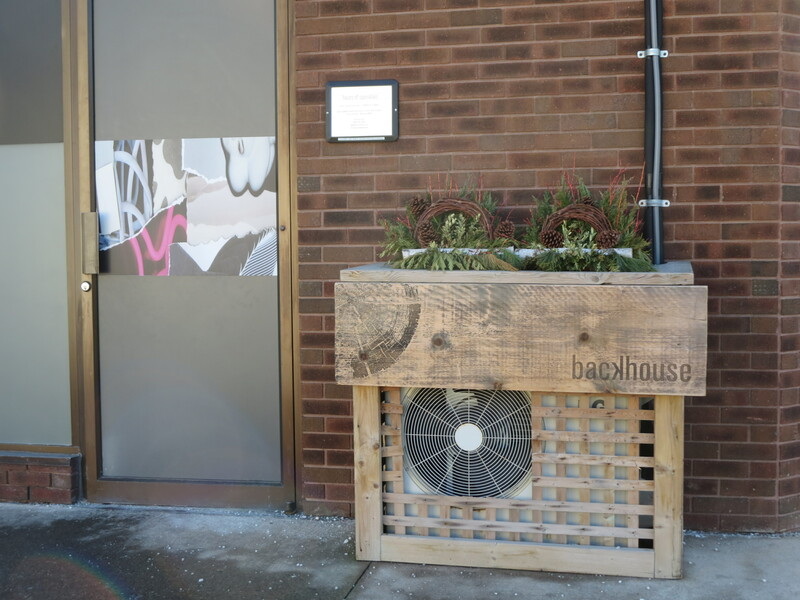 As the name implies — the idea is to inspire folks for the summer barbeque season with a sample of something from the grill and a great Ontario wine. 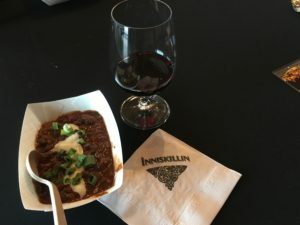 I love the idea and this year the wineries seem to have taken the idea to heart more than in the past, as they have truly tried to serve something that has a BBQ component. 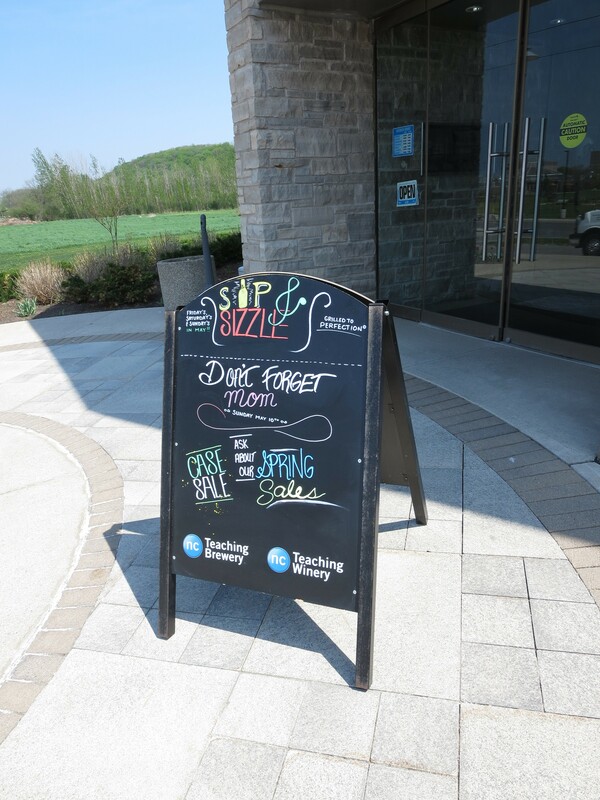 Niagara College Teaching Winery was my first stop and I loved the sign that they had out front with some terrific ideas for Mother’s Day. They are serving their 2010 Dean’s List Pinot Noir with smoked salmon rillette on grilled zucchini. I was curious as to what this would look like and the appetizer was just beautiful. The grill marks on the zucchini are not visible in the photo, but they were perfection and the perfect bed for the rich smoked salmon mouse mound. 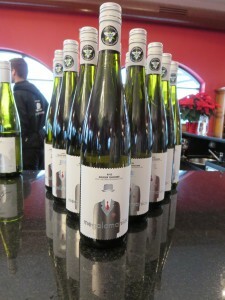 The wine, one of the older vintages featured in this year’s Sip & Sizzle, went very well with the salmon. Having started with a Pinot Noir, I decided to stop at Between the Lines to try their 2012 Pinot Noir, which they paired with a grilled tortilla served with pulled pork and a tropical fruit salsa. Perhaps it was the pairing, but I preferred the 2012 Between the Lines Pinot Noir to the Niagara College’s 2010 and it was a bargain at $15.95. 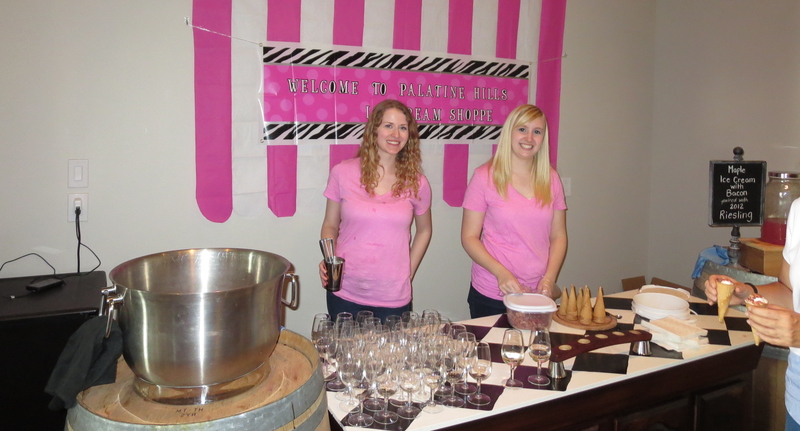 The biggest surprise of the day came at Palatine Hills Estate Winery. They deserve kudos for their creativity in terms of how they got the grilling element in — it was bacon. I know, bacon may not seem too unusual, but it was the crumb topping on a cone of Avondale Maple Ice Cream! Yuck, you say? Well — I say, give it a try. It was delicious! And then, they get even more credit for pairing it with their 2012 Riesling. It was a fabulous combination. It is sure to surprise and delight! Oh — and they even did a great job with the ice cream shop theme at the tasting booth. Well done!! Those are just some of the highlights of the day. 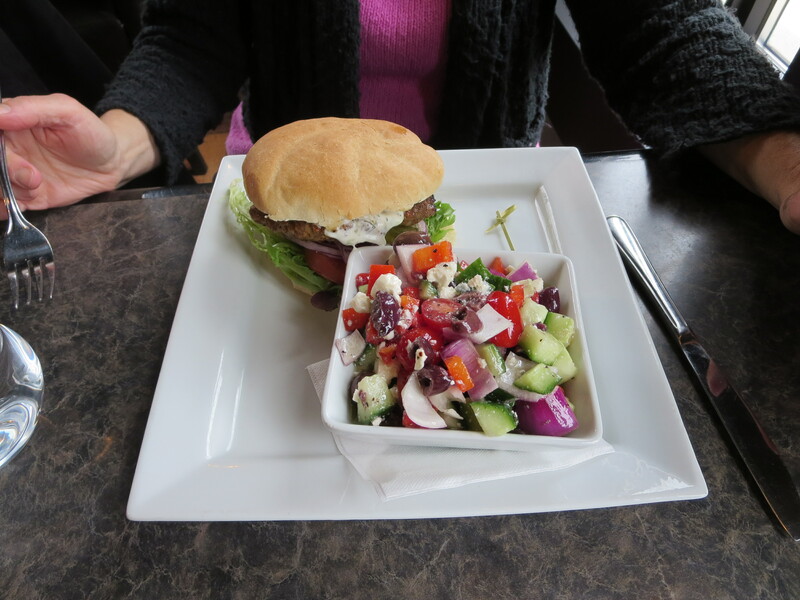 There were many other tasty combinations — but the best thing to do is go out and explore for yourself. And don’t worry — there’s no way you’ll get to all of them today — but the passport is good for Fridays-Sunday for the whole month — so you can always go again and stop at the ones you don’t get to today!